Sarah Ness grew up outside Baltimore, Maryland and attended Notre Dame Preparatory School (NDP) in Towson, MD. In high school, Sarah was introduced to the idea of social justice and the international community. Her first international experience was with a delegation from NDP; they traveled to El Salvador to visit a partner community and sister school. The trip encouraged communication and solidarity between the students and community members of Ignacio Ella Curia, El Salvador and the NDP students. 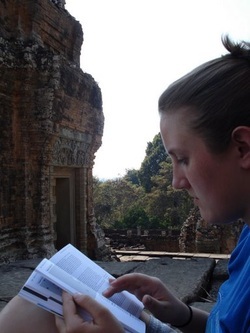 This invaluable experience sparked her interest in international development. Following high school, Sarah attended University of Maryland, College Park (UMCP) and in December 2008, she graduated with a B.S. in Civil Engineering with a concentration in Environmental Engineering and a Minor in International Development and Conflict Management. For her studies, she completed a winter-term study abroad in Laos that focused on cultural and sustainable development in the country. Sarah also continued to pursue her interest in international development through her participation in the university's student chapter of Engineers Without Borders-USA (EWB-USA), where she served as the chapter's President. Sarah was also a project leader for several EWB-USA water and sanitation projects in Ecuador and traveled to Burkina Faso for a solar energy project. The opportunity to compliment engineering knowledge with development to improve the quality of life for others, while personally experiencing and learning from other cultures, molded Sarah's perspective of engineering and her future career. As a young professional, Sarah continued her involvement with EWB-USA through the Chesapeake Professional Chapter, the South East Region, and various National Committees. Additionally, she worked for an engineering consulting firm for a year and a half, gaining professional work experience in the water and wastewater industry. Through all her experiences, Sarah has developed a passion for international development and engineering, specifically the water and wastewater sector. She is excited to continue her education at University of South Florida and gain long-term international experience in the Peace Corps.